Are you thinking about doing your first 5k? YES? Then run with PR Races! PR Races wants to cheer you on as you finish your very FIRST 5k! and help you commemorate this amazing accomplishment! 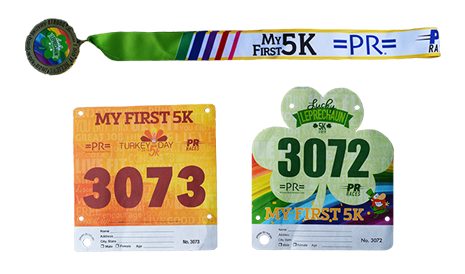 Receive a special commemorative "My First 5k" bib and finishers medal! If you are looking for a way to get started and some training, check out =PR= Training Programs, there is a program designed just for you!